Stamp/sticker advertising Spring Market Week in Chicago Feb. 5th to Feb. 10th, at the Stevens Hotel. 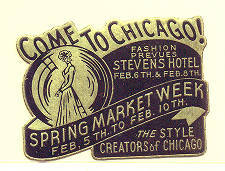 The Stevens Hotel opened in 1927 and was, at the time, the largest hotel in the world. It later became the Conrad Hilton and then the Chicago Hilter. 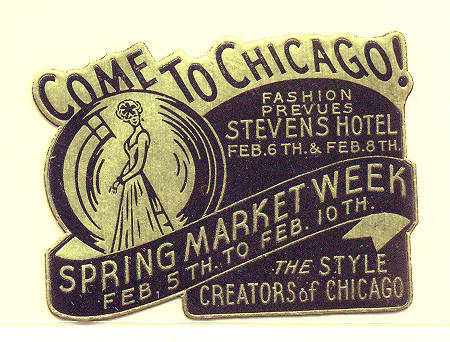 Description Stamp/sticker advertising Spring Market Week in Chicago Feb. 5th to Feb. 10th, at the Stevens Hotel. The Stevens Hotel opened in 1927 and was, at the time, the largest hotel in the world. It later became the Conrad Hilton and then the Chicago Hilter.